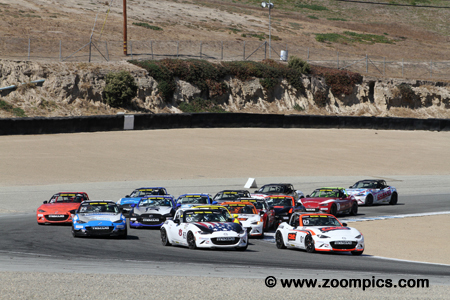 The Battery Tender Global MX-5 Cup presented by BFGoodrich Tires is in its twelfth season. This is a spec series for Mazda’s MX-5 model. The cars are the fourth generation Miata - produced in 2016 and 2017. 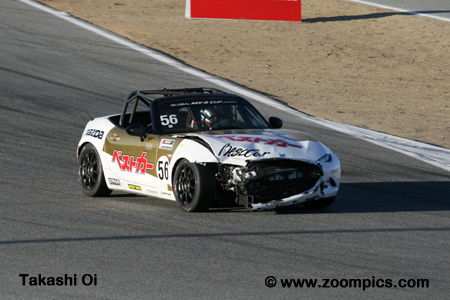 The MX-5 Cup race cars are prepared to series standards by Long Road Racing. The process includes disassembly of the car, welding in a roll cage and the addition of more than 250 motorsports-components. To ensure parity, the SKYACTIV 2.0-liter engine, ECU, six-speed transmission and the limited-slip differential are sealed. The cars can be purchased from Mazda Motorsports for $58,900 USD. The 2017 championship is contested at six different race tracks – Barber Motorsports Park, Indianapolis Motor Speedway, Road America, Streets of Toronto, Watkins Glen International and the finale at Mazda Raceway Laguna Seca. Each race weekend includes two forty-five minute contests. The season ended with Patrick Gallagher taking the championship and earning the $200,000 scholarship to further his racing career. 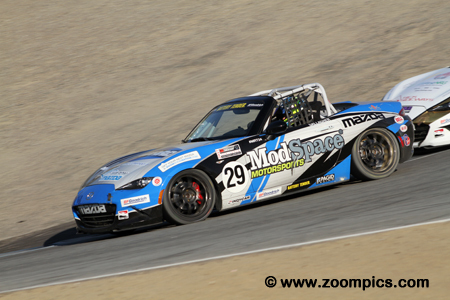 A final event called the Mazda MX-5 Cup Global Challenge took place at Mazda Raceway Laguna Seca on the weekend of October 13-15. It included drivers from the United States, Japan and Europe vying $120,000 in rewards. Competitors would race in two forty-five minutes contests on Saturday. Points were awarded which corresponded to the driver’s finishing position (first – 1-point, second – 2-points, etc.). The racer with the lowest point tally after the two contests would be awarded $75,000. 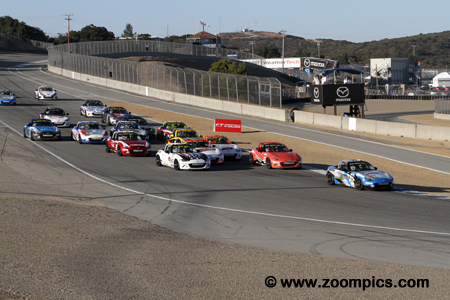 The field heads into Mazda Raceway Laguna Seca’s turn two on the first lap of race one. Leading the way is pole-sitter, Nico Reger driving the No. 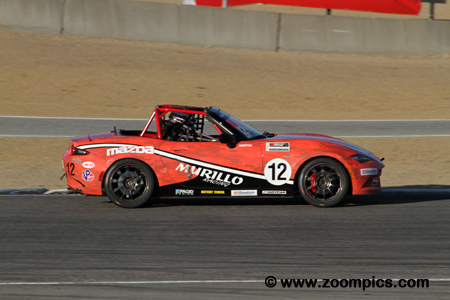 01 Copeland Motorsports Mazda MX-5. Beside Reger is Hooverspeed driver, Robby Foley who started on the outside of the front row. A total of nineteen competitors took the Starter’s green flag. 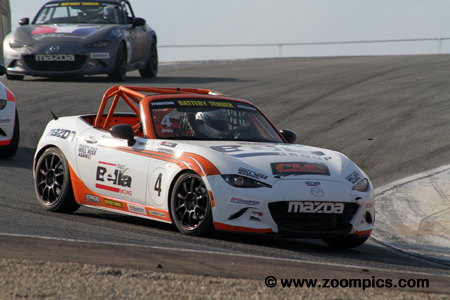 The 2017 Mazda MX-5 Cup Champion, Patrick Gallagher qualified third. Gallagher was one of four former champions in the field – the others were – John Dean II, Kenton Koch and Nathanial Sparks. Gallagher was gridded third for the start of both races and was the first to the checkered flag in each contest. Unfortunately, he received a track limits penalty in race one and was classified second. Gallagher’s victory in race two gave him the $75,000 prize. 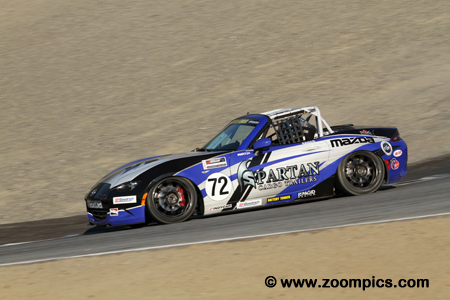 Local driver, Matt Cresci qualified the Slipstream Performance Mazda MX-5 seventh quickest. Cresci made tremendous progress during the weekend’s first race and finished second but inherited the win when first place Patrick Gallagher was penalized. A third-place finish in race two combined with the victory gave Cresci a second in the overall event standings. For his performance, Cresci earned $25,000. Bryan Ortiz drove the No. 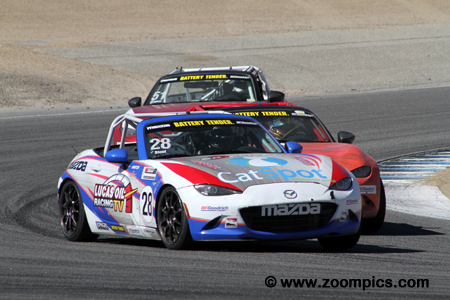 4 Mazda MX-5 and qualified fifth. Ortiz had a number of podium finishes during the season with his best being a second place in race one at Road America. Ortiz started the weekend’s first contest fifth but at the conclusion of forty-five-minutes of racing, he captured the last spot on the podium. Ortiz was running second in the final event but contact on lap-18 with Kenton Koch led to his retirement. 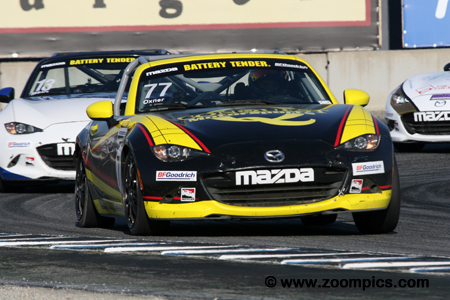 Although he was classified a rookie, Robert Stout entered the 2017 Battery Tender series with an impressive racing resume that included successful stints in other professional sports car series. Despite being his first season, Stout scored victories at Indianapolis and Toronto. He was gridded twelfth for the weekend’s opening race but worked his way through the field to finish fourth. And, in the day’s second contest, Stout recorded another fourth. 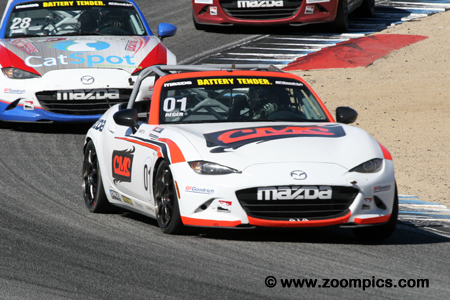 The start of race two and the pole-sitter, Nico Reger gets passed by several competitors before the field reaches Mazda Raceway Laguna Seca’s corner two. Taking the lead is the 2017 Battery Tender Champion, Patrick Gallagher. Surrounding Cresci is his Copeland Motorsports teammate, Bryan Ortiz, the 2014 series champion, Kenton Koch and second fastest qualifier, Robby Foley. The twenty-minute qualifying session was red flagged when 2015 series champion, John Dean II hit the tires in corner six. To add insult to injury, Dean was forced to start at the back of the grid for causing the stoppage of the session. In race one, he charged through the field and finished ninth. Starting last in the day’s second race, Dean managed to claw his way to a tenth place at the checkered flag. His efforts earned him $5,000 for passing the most cars. The highlight of Luke Oxner’s season was a fifth-place finish in race two at the Streets of Toronto. At the Mazda MX-5 Cup Global Challenge, he had a good qualifying effort and started race one fourth but lost a position during the contest and finished fifth. In the final race of the weekend, Oxner battled with Gallagher for the lead and captured the runner-up spot. His results were enough to earn Oxner third-place in the event standings and $10,000. The newly crown Indy Lights Champion, Kyle Kaiser drove the No. 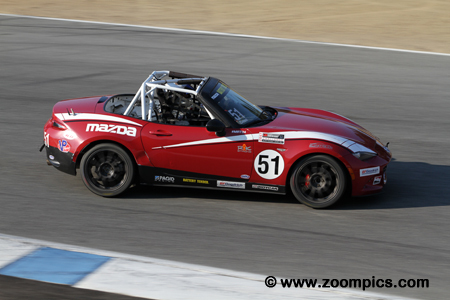 72 McCumbee McAleer prepared Mazda MX-5. Kaiser was gridded sixth for Saturday’s first race and seventh for the finale. In the opening event, he dropped down the order and was classified fifteenth. Kaiser fared much better in Saturday’s last contest – capturing a sixth-place finish. 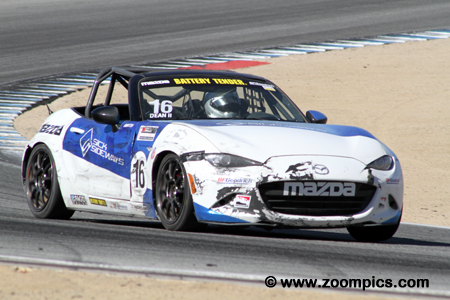 Making his first appearance of the season was the 2014 MX-5 champion, Kenton Koch. Koch was eighth on the grid for the first race and finished seventh. He started the weekend’s finale in ninth place but moved up the race order and passed second place, Bryan Ortiz on lap-18. Unfortunately, the two drivers made contact and Koch was forced to retire three laps later with a mechanical issue. In only his fourth start of the season, Nico Reger driving the Copeland Motorsports prepared Mazda MX-5 was the quickest driver in the first qualifying session. Reger’s efforts earned him the Pagid Super Pole Award which was worth $5,000. He also started from the pole in race two. Despite the great starting positions, Reger fell off the pace and finished tenth in race one and was seventh in Saturday’s second contest. 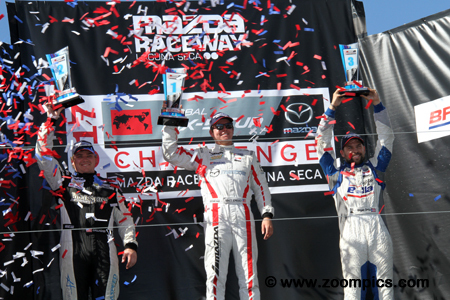 Race one’s Mazda MX-5 Cup Global Challenge podium. On the top of the rostrum is the winner and benefactor of the leader’s post-race penalty, Matt Cresci. To the left of Cresci is the series 2017 champion and runner-up, Patrick Gallagher. Completing the podium is the third-place finisher and a series rookie, Bryan Ortiz.